Flatbush, NY - Nathan’s, Shmathan’s! Welcome to the borough’s first kosher hot dog eating contest. The event is slated for between 1-2 p.m., Sunday, Oct. 25 at Brooklyn Burger Boyz in the heart of one of the borough’s largest kosher restaurant rows, at 533 Kings Highway. Ades said the dogs of choice will be A&H (Abeles & Heymann) Kosher Franks, along with Pas Yisrael’s bread. A&H hot dogs are certified Glatt and held to the strictest standards of Kosher supervision. “A & R hot dogs make Nathan’s hot dogs look like chopped liver,” claimed Ades. Ades said the idea to throw a kosher hot dog eating contest came through Burger Boyz owner/entrepreneur Joseph Bijou, who owns over 20 Burger King Franchises throughout the New York tri-state Area, as well several Pop-Eye’s Fried Chicken chains. Joe decided to do this to give something back to the community, so all the proceeds from the event will go toward local food pantries to help feed the less fortunate, Ades said. Like Bijou’s other eateries, Burger Boys serves their food fast, which also includes fresh made to order hamburgers, chicken and other grill items and an assortment of fresh salad with homemade dressing. The rules for the event include a $10 entry fee in which contestants will be given the option of eating their hot dogs plain and then the buns, or hot dog and bun together. Unlike the 12-minute Nathan’s contest, this gastronomic affair will be all of five minutes. “This is a hot dog eating sprint contest,” said Ades. The first place winner will receive a $300 cash prize, and the first four runner-ups will receive a free meal for two at Brooklyn Burger Boyz – a $25 value. Ades said the winner will also receive a blue and white belt - the colors of the Israeli flag. Pre-registration is recommended as the contest is limited to 50 spots. Contestants can register by visiting www.brooklynburgerboyz.com , going to the restaurant in person or calling 718 483-9360.
does anyone know if this is for woman also or only men?? These contests are really disgusting and glorify unhealthy personal gluttony. YAY! I can beat anyone at an eating contest! Bring it on! No one can out eat me! Isn't this the kind of thing Ramban mentioned in his commentary to Parshat Kedoshim when he used the term "naval b'reshut haTorah"? Difference is that they will give doggie bags to take home leftovers. “ Isn't this the kind of thing Ramban mentioned in his commentary to Parshat Kedoshim when he used the term "naval b'reshut haTorah"? Doesn't Hatzolah run programs on the dangers of overeating? Making a sport out of gluttony is hardly the sort of thing which reflects well on Judaism, Torah or kashrut. 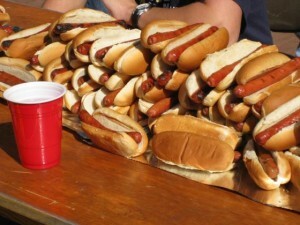 There's nothing Jewish about a hot dog eating contest. That's a real Torahdik way to spend your time. This is nothing new, I see food eating contests every Shabbos at the Shul Kiddush! disgusting! how low can people stoop?! Call the Vaad of Flatbush at 718-951-8585 and voice your opinion. They give the chechsher to this place.
" Burger Boyz owner/entrepreneur Joseph Bijou, who owns over 20 Burger King Franchises throughout the New York tri-state Area, as well several Pop-Eye’s Fried Chicken chains." Isn't there a problem with a Yid owning such places? This is assur (prohibited) al pi halacha (according to Jewish law), as it involves bizayon ochlin (treating food disrespectfully), injuring one's body (since overeating and eating so much so quickly is not healthy), bal tashchis (wasting food), chillul Hashem (desecration of G-d's name, when Jews, especially 'religious' ones do such things), etc. Whoever grants the kosher supervision to this establishment should tell the owners that it is not kosher and if they don't cancel it, they should remove the supervision. It is as kosher as having exotic dancers there. People should protest as well. The non jewish contestants should be required to make a hamoitzi also, otherwise its not a level playing field. such nachas, ,you must be so proud! a chillul HaShem @ ANY time, my friend! Isn't this a custom from the Romans? Does it come with free stomach-pumping and high blood pressure medication? I don't get it. Yom Kippur was TWO DAYS AGO! And now this disgrace? No wonder we are still in golus. I am pretty sure most people on this website live under a rock. Get out of the shtetl people. And for the people that say you are hurting yourself, how come Jews smoke without any stupidity from this site? Where are the rabbanim who asured concerts ??? Is this behavior better than attending a Concert with seperate sitting ??? With respect, while I share your view of this rather disgusting spectacle, I don't think it's appropriate to complain to the Vaad. It's the Vaad's job to make sure that the hot dogs are kosher; they really cannot (and should not) be held answerable for what people choose to do with them. Not only is that unfair to the Vaad, it asks them to start looking into any number of issues unrelated to kashrus. "Ades said the idea to throw a kosher hot dog eating contest came through Burger Boyz owner/entrepreneur Joseph Bijou, who owns over 20 Burger King Franchises throughout the New York tri-state Area, as well several Pop-Eye’s Fried Chicken chains." if he owns burger king and pop-eyes, why doesnt he make a few kosher? Are you guys kidding? I mean, seriously? It's barely a day after Yom Kippur, and you have nothing better to do than criticize even this? Is there anything that VIN can post that you know-it-alls can't find something wrong with? I mean, hot dogs? This bothers you? Do you post these ludicrously misspelled halachic citations just to show off? Does everyone in your family already live at your high standards that you have to look for trouble here? IT'S A HOT DOG EATING CONTEST, FOR HEAVEN'S SAKE! Some of you really need to get a life! I am proud! Especially since I'd probably be the smallest person there! “ Are you guys kidding? I mean, seriously? It's barely a day after Yom Kippur, and you have nothing better to do than criticize even this? seriously. finding fault with someone's pleasure is the chilul hashem here. not the other way around. i don't understand why this upsets people anyway. there are similar eating competitions at other kosher eateries. consider noah's ark ginormous burger contest. you are asked to eat 36 oz of burger in one sitting to get a prize. i have no problem with that. i have no problem with this. this doesn't quite meet the definition of gluttony if it happens only once. a glutton is someone who does this consistently. Some of us need to get a life? Well we DO have a life, a Torahdik life that looks askance at such unbelievable blattant acts of gluttony and exaltation of materiality. This was precisely what the Romans exalted. Clearly chukas hagoi which we just heard on Yom Kippur that b'chukoseihem lo seleichu. we should all boycott Burger Boyz and also stage a community protest. I wonder what is considered be to a Bigger C'H. A once in a while hot dog contest, or bachurim dressed in an obvious frum way, smoking cigarettes every day? They are both detrimental to one's health, but eating a large amount of hot dogs one day and smoking for years is hardly comparable. Smoking is proven to cause several different types of cancers. Every time you light up a cigarette, you are slapping God in the face. And what about the outsiders seeing Jews smoking a cancer stick? Smoking is an outright statement saying you don't care about the beautiful body and life Hashem has Given you (also the lives of others seeing that second hand smoking Kills too). So before crying to the Rabbanim to come shut down the hot dog contest, maybe you should cry about the many Jewish people, young and old, killing themselves and others with their smoking habit. Let's put things into perspective people, and solve a Real problem affecting a large part of the Jewish Orthodox community. “ I wonder what is considered be to a Bigger C'H. A once in a while hot dog contest, or bachurim dressed in an obvious frum way, smoking cigarettes every day? They are both detrimental to one's health, but eating a large amount of hot dogs one day and smoking for years is hardly comparable. Smoking is proven to cause several different types of cancers. Every time you light up a cigarette, you are slapping God in the face. And what about the outsiders seeing Jews smoking a cancer stick? Smoking is an outright statement saying you don't care about the beautiful body and life Hashem has Given you (also the lives of others seeing that second hand smoking Kills too). what does one have to do with the other?two wrongs dont make a right! #37 gets the medal for best comment on this post. Well said. Shame on all of you!! “ #37 gets the medal for best comment on this post. it's sad when a yid becomes so insensitive to the surrounding and apparently permeating goyishe culture.as chaim said in #41,this is the way of the romans who's idea of a party was to eat till they could eat no more,go into an enjoining room called a vamitorium,use the room for it's intended purpose and then go back to the party to eat till full yet again. “ what does one have to do with the other?two wrongs dont make a right! I'm just putting things into perspective. Before everyone tries to fix this "problem," I feel there are more pertinent issues at hand here, for instance, smoking. And yes, they Are Very similar. They both have to do with our health or lack thereof. Who said smoking is permitted. But that's not the point. This story is talking about fressing. If you want to talk about smoking lets wait for VIN to have a story about a smoke off contest, we'll get into it then. So are you saying the Vaad should allow this and take an "anything goes" attitude as long as the food is kosher? Should mixed dancing and xmas parties be allowed? Why not stay open on Shabbos after all the food was purchased and brought into the store kosher? For money everything is kosher. okay, this is really embarrassing. would you boycott Noah's Ark for offering a prize to someone who eats a 36oz hamburger in one sitting? but no, having a few extra hot dogs is not acceptable. please stop passing judgment. you only live once, and it's unhealthy to only work all the time. These mashgichim will not be offended. They are allowed to eat all they want as part of their compensation so this contest will not be anything really out of the ordinary. “ I am pretty sure most people on this website live under a rock. Get out of the shtetl people. Pigging out is for pigs. It's not a Jewish thing. I suggest a 20 yr smoking contest. You work it out I'll get the sponser (guess who)! Who's talking about making a right out of two wrongs? I think yo is pointing out the fact that there is a hypocrisy. If you plan to point out what you think others are doing wrong and cite Hilul Hashem, you need to take a good look at yourself and decide whether you are righteous enough. Let's have some fun here! Bring out the dogs!!! This is disgusting and not a jewish thing to do. What are we trying to be like pigs? Will there be bathrooms posted outside? This guy owns several burger king franchises? Isn't bossor b'cholov ossur b'hanoha? How does he profit from a cheeseburger? Who gives a hechshar to his kosher store? I wouldnt be too shocked when we hear about a scandal here shortly where some meat got mixed up. It's ridiculous to organise "kosher" "eating contests". I can't believe reading all these chachumim. A guy tries to publicize his business, and a pack of idiots come out to condemn him for doing something to promote his business. Everybody here has some idiotic negative remark. Live and let live. His kashrus is fine. Its a five minute event, what's the big deal. Do we have to always find some negative twist on any word that is mentioned here on this site. Its incredible that every time something is said here, the idiots come out of their important do nothing affairs and start putting a daas toirah that its wrong to do this and that. Stop the garbage already. What if it was a cholent fressing or kugel lecking contest, would you have the same response? Imagine if the top it off, we would have all the 10 botei dinim and all the top rebbes be the judges on who actually won the contest. And the winner gets 10 kapores of his choice, 10 mehuder $300.00 Deiry luluvim and mivchar shebevmichorim esroigim, which which checked by 20 rabonim of all stripes and a 2 year anytime pass to the Mikvah of his choice. Would that contest satisfy all you critics???????? What a pack of idiots. Gimme a break already. i have only one word to say on the whole thing--DISGUSTING !!!! this is not the way a Jew should lead his life. do we have to do everything the non Jewish world does??? PHEH!! Before you speak you should watch your husband and his friends behavior at the shul kiddush. At least here it all for tzedaka. What about all the food that goes to waste at lavish simchas? Funny. Me too! Do we go to the same shul? First of all i think that for 1 they should take the hashgocho away and the truth is in my opinion, no one should eat from the vad of flatbush for things like this as well as others. its a vad running on a father and son theme and if i remember correctly i'm not so sure i'd trust the son all that much. Thats funny... you know what I find to be a real "shanda" right after Yom Kippur? Holier-than-thou yidden telling other people how to live their lives. A true sign of anivus. Keep it up, guys. The Vaad of Flatbush is an excelllent hashgacha! I personally know the Rav Hamachshir. He is a yarei shamayim and is very reliable. He was appalled by this contest! It involves making Brachos she'ano tzrichos because most of what gets eaten ends up being thrown up, besides for achila gassa! Jewish people are supposed to eat to live! Not live to eat! We are supposed to eat in order to be strong to serve Hashem. This is the opposite. I hope this contest was canceled!